We are a leading Service Provider of Integrated Business Ecosystem User Experience Platform, Contract Management Solution, Smart Document Processing Solution, Big Data Portal, Big Data Analytics and Big Data from Ahmedabad, India. Portals in organizations have matured significantly over time. Along with the industry trends Portals too have become more web and social oriented, with more focus on rich applications. The demand for portals is towards a User eXperience Platform that provides a combination of features including content, collaboration, context, analytics, enterprise search, rich integrated applications, e-Commerce, and mobile. UXP is aimed at creating and Integrated Business Ecosystem (IBE) to address the CxO level need of aligning individual, departmental and corporate goals, with the User eXperience (UX) as the key to improving organizational productivity. CIGNEX Datamatics’ portal solution (Integrated Business Ecosystem) is focused on key activities and processes and are positioned to help companies achieve business goals i.e. user experience, increased collaboration, transparency, and knowledge sharing across various sections within the organization. The solution is flexible to integrate across the existent technology ecosystem (ERP, CRM, ECM, BI etc.) which includes mission critical solutions, legacy technologies, homegrown applications etc. The extension enables use of the solution irrespective of content type, system architecture, operating platforms, devices, or network and addresses the needs of various stakeholders - Employees, Clients, Partners, Suppliers, Government, Financial Institutions. Organizations can be found managing hundreds to millions of contracts on a transactional basis. The responsibility is shared among managers, professionals, attorneys, and administrative staff. With growing impetus to regulatory compliance, the complexities of written contracts increase significantly. More elements than ever are involved in the review process, and with the growing volume the entire process is more complicated and leads to wasted time and dependence on more resources. Contract Management Solution is an automated contract management application that targets to track, monitor and process contract agreements throughout its lifecycle starting from drafting to activation and monitoring. It starts from contract creation and then sent for negotiation, approval and execution phase. CIGNEX Datamatics’ Contract Management Solution (CMS) has a highly sophisticated event notification feature that provides notification alerts on various events like expiration, termination, amendment and renewal. It provides a highly secure web based contract management solution that adds useful summaries and it facilitates the centralized repository to manage the complete contract lifecycle from Creation to Negotiation to Execution, to Administration and thorough Analysis. Why Smart Document Processing (SDP) ? Document can be a note, contract, barcode, signature, graph, diagram, image or in form of structured or unstructured data. It acts as an asset to the company and plays a vital role for decision making. Organizations face a major hurdle globally to manage various such documents resulting heavy investment for processing high volumes of documents. Every document has a life cycle, including creating, editing, distributing, printing, reading, scanning and reusing. All these stages can be enhanced with a Document Processing solution. Document Processing involves the conversion of typed and handwritten text on paper-based & electronic documents (e.g. scanned image of a document) into electronic information utilizing one of, or a combination of, Intelligent Character Recognition (ICR), Optical Character Recognition (OCR) and experienced Data Entry Clerks. CIGNEX Datamatics addresses organizations’ document processing challenges by its Smart Document Processing solution with a unique combination of IQ - an intelligent document processing platform with Artificial Intelligence, Image Topography Analytics, Programmatic Business Logic and Alfresco - next-generation Open Source enterprise platform. CIGNEX Datamatics’ Smart Document Processing solution go beyond mere capture and archival, into the realm of intelligent interpretation, helping customers automate their end-to-end document processing cycle, optimize business processes and intelligently validate and route business information to the right people at the right time in the right format. Smart features like auto-masking of critical information and encoded break-down and regrouping of information ensure high levels of security for the information being processed. With the ability to process both, structured and unstructured documents covering handwritten, typewritten, bar-coded and check-marked information, CIGNEX Datamatics Smart Document Processing solutions offer unmatched versatility to the client’s varying organizational document processing requirements. Smart Document Processing solutions leverages next-generation technologies like Programmatic Business Logic after the traditional image capture and optical character recognition, to intuitively identify, digitize, validate, archive, analyze, mass customize and present documents in any type or format. Customers benefit from dramatic productivity gains, high accuracy, accelerated cost savings and real-time visibility across the document life cycle. Data Deluge is a growing concern and with the global information overload the challenge for organizations encounter is to organize and manage them efficiently for competitive advantage. Websites like MTV or Slashfilm providing latest videos, podcasts, images and content to the users as well as ability to subscribe for content that they can access within their device applications. In this competitive world, it is becoming a business need to process information real-time and present it securely to customers, web applications and to variety of devices. >We have integrated two leading Open Source technologies, Liferay and MongoDB to build a powerful, cost effective solution as “Big Data Portal” to the ever growing need to manage the vast amount of information available. Big Data is at the foundation of many technologies that are trending today. With years of proven global experience in Open Source, we are excited to be pioneering solutions that solve many of today’s growing challenges. Existing Data Warehouse and ETL (Extract, Transform or Load) systems fail to handle complex and massive parallel processing for cohesive operational problems and pose scalability issues in a long run. Big Data Analytics can enable organizations in gaining competitive edge through identifying market insights, industry research etc. by analyzing massive amounts of data. Big Data analytics combines complex data processing and data quality to deliver complete, timely and accurate information to the business users. Big Data Technologies such as Hadoop, MongoDB, and Neo4J are crucial, as the industry demands insights from increasingly larger data sets. More importantly it should also complement the existing ecosystem of legacy applications, e-Commerce, ERP, Portals or Enterprise Content Management Solutions. CIGNEX Datamatics Big Data consulting services and solutions offer integration of Big Data Technologies with Enterprise applications that help in acquiring, organizing, analyzing and presenting information irrespective of place or time. So data based on the variety and volume is aggregated using Big Data Solutions. For example, Hadoop for unstructured or machine stream content, MongoDB for documents, images, videos and other media content, or Neo4j for data that involves building relationships. test execution on multiple browsers and generates test reports. Acting as a base framework for test automation, it simplifies web application testing efforts. Mercado is a marketplace for software applications for an IT department to create a user centric collaborative interface within a controlled environment. The primary use case of Mercado is to create a “Knowledge Repository” of products, for example software products, reports, videos, photos, code snippets and other reusable items which could be downloaded via internet. Liferay SAP ECC Connector integrates SAP Sales and Distribution (SD) Module within SAP ECC with Liferay Portal. The integration provides an enterprise class user interface for managing sales orders, purchase orders from SAP. User Experience Platform (UXP) is an integrated set of technologies collaborated into a highly user centric interface. Future portals, web and mobile deployments would provide accessibility to services like search, analytics, e-commerce, content, social, collaboration, content and context. Enterprise Search is an integral component for organizations to allow users to quickly find required information in numerous & disparate repositories. Enterprise Search plays a crucial role in providing the basic technological components of search like content collection, crawling etc. within the enterprise intranet and other functions. But the recent demand from search functions are more channeled towards delivering information in a user friendly presentation and other value added services like intelligent clustering, functional categorization, and semantic analysis, advanced query processing. CIGNEX Datamatics provides powerful Enterprise Search Solutions for databases and content management repositories. By integrating Big Data with Enterprise Search Engine solution like Solr there can be an effective improvement in the search performance in the form of average search time or document throughput. Full Text Search: Search within web pages, documents, logs etc. Other important features include a secure access to information, role based delivery of information as well as the queries should deliver context related results to the user. Comprehensive reports based on logs, audit trails etc. Using Cloudera’s distribution of Hadoop we can capture huge volumes of log files that were previously unused to can derive intelligence. Unlike proprietary solutions, CIGNEX Datamatics uses a distributed model for data collection and processing. Flume (a reliable data collection solution provided by Cloudera) is used for aggregating the log data and is stored in the distributed file system of Hadoop (HDFS) as large data sets. Chukwa is a Hadoop project dedicated to log collection and analysis. These data sets are delivered for large scale analysis and later transmitted to Hive framework where we integrate with BI tools (Pentaho) or Portals (Liferay) to derive real time reports and info-dashboards. Alfresco is a cloud-connected Open Source Enterprise Content Platform, providing Document Management, Collaboration, Records Management, Knowledge Management, Web Content Management, Rich Media Management, imaging capabilities as business critical content platform, tablet and mobile workplace, and APIs for content-centric applications. Based on Open Standards, Alfresco's Enterprise Edition solution focuses on low cost subscription model with lower Total Cost of Ownership (TCO) by reusing existing hardware and software components. Drupal powers over a million sites, including WhiteHouse.gov, World Economic Forum, Stanford University etc. Magento is a feature-rich, Open Source, enterprise-grade e-Commerce platform with advanced CMS features. It provides organizations unmatched flexibility and control over the look, content, and functionality of their e-Commerce store. Magento’s intuitive administration interface features powerful marketing, search engine optimization, and catalog-management tools to help organizations tailor it according to their business needs. CIGNEX Datamatics’ UI (User Interface) services include conceptualization, design, development, theme integration, site optimization, semantic coding, cross-platform compatibility, and devices compatibility. Our team creates applications and websites which are user-centric with rich look & feel. Our team has extensive UI experience with JQuery, AJAX/Java Scripts, HTML/XHTML, CSS, Dojo, and integrating with various RIA frameworks such as Alloy UI, Vaadin, ZK, and YUI. We also work with various digital marketing agencies and integrate HTMLs (delivered by agencies) with Open Source products such as Liferay, Drupal, and Magento. Identify the best possible Open Source technology to meet client's objectives. We have a rich understanding of, and ready access to, Open Source platforms that help solve enterprise application challenges. CIGNEX Datamatics provides Alfresco consulting services to worldwide clients to build effective business critical content platform, tablet and mobile workplace or API for content-centric applications. With over 50 Alfresco consultants, 80+ Alfresco implementations, extensive development/migration experience and expertise with integration with various proprietary and Open Source applications like Liferay, Drupal, Jive, Google Docs, QuickOffice, Ephesoft, Microsoft Office and MuleSoft, CIGNEX Datamatics is an ideal Alfresco Consulting Partner for enterprise content management Solutions. Our Alfresco consulting services enable clients to build cloud connected Open Source Enterprise Content Platforms, providing Document Management, Collaboration, Records Management, Knowledge Management, Web Content Management, Rich Media Management and Imaging as business critical content platform, tablet and mobile workplace or API for content-centric applications. CIGNEX Datamatics provides Liferay consulting services to worldwide clients to build an effective Portal and Social Collaboration enterprise solutions. With over 150 Liferay consultants, 100+ Liferay implementations, extensive development/migration experience and expertise with integration with various proprietary and Open Source applications, CIGNEX Datamatics is an ideal Liferay consulting partner for enterprise Portals, Social Collaboration and Content Management Solutions. 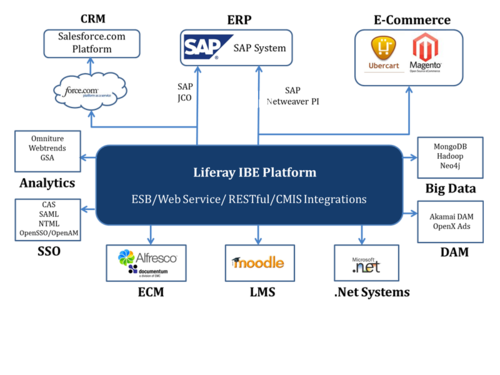 Our Liferay consulting services enable client to build “User Experience Platform/Next Generation Portals” with core capabilities such as context architecture, portal framework, WCM, social collaboration, enterprise mobility, e-commerce, search, and analytics. As a Magento Silver Solution partner and certified developer, CIGNEX Datamatics facilitates organizations that want to grow their online business with an Open Source based robust, powerful, and flexible e-Commerce platform with advanced CMS features. With 50+PHP consultants, extensive experience in development/migration/integration of various proprietary and Open Source applications (like Liferay, Moodle, SITEMINDER, OpenSearch and many more), CIGNEX Datamatics is an ideal Magento-based e-Commerce consulting service provider. CIGNEX Datamatics has a highly experienced consultants (ISTQB/CSTE/HP-AIS certified) passionate about delivering 0 UAT defects by defining testing strategy and leveraging processes and automated frameworks (code quality tool Sonar, Continuous Integration tool - Jenkins, test automation frameworks – Selenium, QTP, In-house frameworks such as CIGTAF, DARTS, Dartenium). Our service covers all aspects of verification and validation - functional, security, performance, specialized testing, and configuration & compatibility testing. Our processes are CMM, ISO and IEEE standards compliant. We assist our clients in achieving enterprise mobility through mobile websites, mobile porting, mobile applications, and mobile web services. We also provide wide platform capability for our solutions to enable seamless customer experiences across all portable platforms. CIGNEX Datamatics offers focused and comprehensive training on Open Source products like Alfresco, Liferay, Magento, MongoDB, Drupal, and Cloudera Hadoop to help organizations develop deeper competencies in Open Source products. We are committed to providing clients with the instruction, tools, and experience they need to maximize the value of investments. We offer private and public trainings through our hands-on trainers with years of combined industry experience. CIGNEX Datamatics has certified trainers for providing industry standard training on Liferay and Alfresco. e-Commerce Portals have been a necessity for organizations as customer demands and purchase patterns have changed over the past few years. Flexibility, security, and scalability are a few critical needs for any e-Commerce portal. At CIGNEX Datamatics, the adoption of e-Commerce portal is made easy through simple user interfaces and applications that are scalable and easily integrated across platform ecosystem within the organization. Extranets are important for organizations as they facilitate transactional business activities between stakeholders, be it business partners, vendors, suppliers etc. Many organizations still rely on emails and phone for communication with stakeholders that not only is manual overload but poses critical challenges for maintaining visibility and efficiency. CIGNEX Datamatics provides organizations with extranet portals at a low cost of adoption and that seamlessly integrate with the enterprise applications within the organization. Enterprise search to track shipment, download versioned documents, invoice etc. With widespread adoption of Social Networking tools employees demand more social tools that lead to efficiency and alignment with the business goals. Digital Media including videos, high definition images, Flash files and other components are of integral value in organizational activities. Digital Asset Management Software (DAM) is a single access point for all the rich digital media and its underlying metadata information throughout the extended enterprise. CIGNEX Datamatics Open Source Digital Asset Management system centralizes storage and provides easy, efficient, enterprise access to digital assets, and allows them to be quickly repurposed, which streamlines processes and reduces cost. Integration with external API, hosted solutions etc. Organizations often face communication gaps caused by semi-automated systems and reliance on email systems. The challenge is not only ensuring the transparency but also ability to retrieve documents based on needs. CIGNEX Datamatics Document Management solutions provide organizations with all the services necessary for creating, converting, managing, and sharing electronic documents. Built on industry-standard Open Source platforms, CIGNEX Datamatics solutions ensure completeness, validity, traceability, and inalterability of important documents. CIGNEX Datamatics Records Management solutions provide a secure, auditable environment for creating, declaring, classifying, retaining, and destructing records. Through our solutions, organizations can ensure compliance by defining and enforcing policies for records use, storage, and disposition with a legally defensible audit trail. CIGNEX Datamatics’ cost effective Web Content Management solutions provide a rich environment for creating, managing, and publishing web content, and an infrastructure for supporting multiple sites. The WCM solution includes easy-to-use inline editors for text, HTML, and XML content, and connectors for editing documents using a variety of familiar desktop tools. For formatting simplicity, a transformation engine that converts content from one format to another is provided. For example, incoming images of various types and sizes can be converted to a standard format and size. Drag-and-drop layouts let users customize the look and feel of a web site without dependency, and granular control over security enables content authors to secure web pages and the files, images, and videos embedded in them. E-Learning, also known as virtual learning or online learning, is the fundamental process of using online solutions for teaching and learning via the web. The e-Learning solutions have matured a lot since its inception with learning content management solutions keeping in mind group cohesion and community sharing. CIGNEX Datamatics provides Educational Institutions with an e-Learning platform where students and teachers can not only collaborate, but also can conduct tests and submit assignments based on their custom pedagogy. Institutions are focusing towards media for fulfilling their learning objectives and CIGNEX Datamatics can provide solutions with multimedia and tools to help in research and aggregation. Multimedia features like videos, images etc. Enterprise Resource Planning Solutions are mission critical solutions in every organization. They are integral for business management, planning, sales and distribution, plant management, materials management, manufacturing, finance and accounting, human resources and logistics. It is important as it impacts every functional activity and department within the organization. They help organizations optimize activities (like reducing assembly time), remove redundancy, and improve transparency across all the stakeholders within the business entity. CIGNEX Datamatics provides organizations with a scalable ERP platform that is not only easy to maintain but also provides immense flexibility and can be extended with growth of organizations. Also the peripheral solutions are integrated with ERP like Portals, CMS solutions which provides transparency and cross departmental collaboration. Web enabled CIGNEX Datamatics can help organizations adopt the solutions with lower total cost of ownership. Provides a roadmap to successful installation, customization and deployment. Document dependency and paper trails are still major concerns within organizations. Even after countless processes go paperless organizations still have tax documents, contracts, invoices, HR records, policies, insurance, investments etc. in paper based forms. CIGNEX Datamatics provides an alternative with Imaging Solutions which allows efficient document capture and is integrated with Document and Record Management solutions for file transfer, versioning, metadata extraction etc. Imaging solutions provide accuracy in classification of documents, and also seamlessly enables users to retrieve documents through search. Security features at user level and document level provides confidence for treatment with confidential information and files.